On a steamy sidewalk in Miami’s financial district, experiencing a kind of awestruck claustrophobia from towering condos and offices, it is easy to become disconnected from the garden. Yet in South Florida we are surrounded by lush gardens, both natural and manmade. 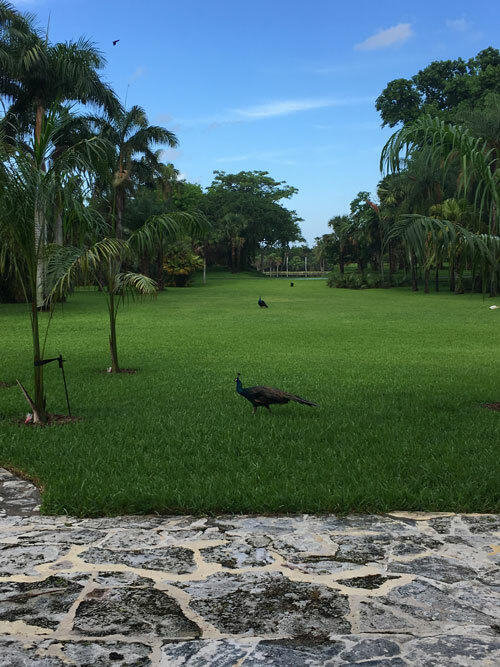 From the 1.5 million acres that comprise the Everglades to the hundreds of acres defining a cache of old estates, we can be reacquainted with the garden in no time. Among those gardens fashioned by the human hand — Fairchild Tropical Botanic Garden, Vizcaya, Deering Estate and the Barnacle — is the 120-acre site of Robert and Eleanor Montgomery’s winter home. The residence is seen through a stand of Wine Palms (Pseudophoenix vinifera), which are from Hispaniola. The shape of the trunk is spectacular! M. Patrick Griffith is the Executive Director of MBC, a position he has held since 2005. His background includes living collections management, herbarium curation, laboratory research and land management for botanic gardens, universities, government, and private interests. Patrick’s academic activity has been in plant systematics and plant conservation, and is focused on living botanical collections. He holds a number of degrees: Doctor of Philosophy in Botany (Claremont Graduate University and Rancho Santa Ana Botanic Garden), MBA (FIU), Master of Science in Biology (Sul Ross State University), and Bachelor of Arts, with a concentration in Botany (University of Texas at Austin). Montgomery was largely self-taught, a man who, as they say, made good. In fact, he made much better than good. He began working at 14 and never completed high school, yet as an adult he was a successful attorney and accountant. He authored 40 books on the subjects of accounting, finance and taxes. He was one of the founding partners of an accounting firm, Lybrand, Ross Brothers, & Montgomery, which is today’s PricewaterhouseCoopers. He also developed the accounting curriculum for Columbia University and was the school’s first accounting professor. Montgomery was commissioned as a Lieutenant Colonel during World War I and worked on the War Industries Board. In 1930 he served on the War Preparations Committee which earned him the rank of colonel. Montgomery lived in Connecticut and commuted to work in New York City; by 1930, he was wintering in the Miami area. 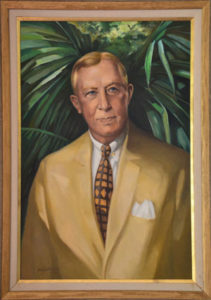 In 1932, he began building his home and planning his tropical garden in Coral Gables. Constructed on what was an original section of Old Cutler Road, the Colonel used his influence to have the original road re-routed, using “his” section of the road as the private approach to his home. Among the Colonel’s many interests was plant collecting. Through his friendship with George Brett of Macmillan Publishing Company (both as neighbors in Connecticut and Florida), Montgomery was inspired to purchase the acreage for his winter home. Tom Fennell, who was assistant director of the Plant Introduction Station at Chapman Field, found the land for the Montgomery estate. He also supervised the clearing of the land and the purchase of plants for the Coconut Grove Palmetum on Montgomery’s property. Through his association with Brett and Fennell, Montgomery met and conferred with Dr. David Fairchild (1869-1954), America’s leading plant explorer. A deep and abiding friendship grew between Montgomery and Fairchild. Montgomery his wife Nell, hang in the living room. In 1934, Montgomery wrote to another good friend, Marjory Stoneman Douglas: It would be a lasting disgrace to all of us if we do not provide for a permanent tropical garden bearing David Fairchild’s name. The Colonel, Nell and Fairchild worked with a group of plant collectors and horticulturists that included Marjory Stoneman Douglas, County Commissioner Charles Crandon and landscape architect William Lyman Phillips. 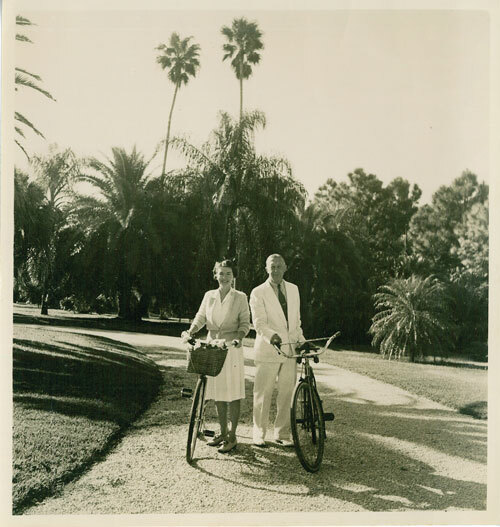 They toiled to create the Fairchild Tropical Garden which opened in 1938 on 83 acres of land conveyed to the County, 58 acres of which had been purchased and donated by Robert and Nell Montgomery. Nell Foster and the Colonel met at Chapman Field in 1934 and were married that same year. Their marriage was described by Douglas to be one that was an enduring and greatly creative thing. Nell was the Colonel’s third wife. She was 32 years younger than her husband. Originally from Tennessee, Nell wintered with her parents in a home they purchased in Larkins (now the City of South Miami) in 1910. By 1926, the Foster family had moved to Coconut Grove and went through that year’s destructive and disastrous hurricane. Nell’s parents were hard-working and practical. For a short time, Nell’s mother Isabel ran a camp for girls in the Grove, with Nell pitching in. 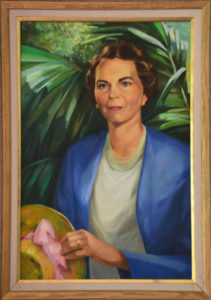 Nell was just as involved in the creation of Fairchild Tropical Garden as her husband, serving as co-founder, the first president of the Garden, as well as one of the organizers of the original Committee of 100 (a leadership group), and the organizer of the Garden’s first fundraising event, the Ramble (which continues to this day). 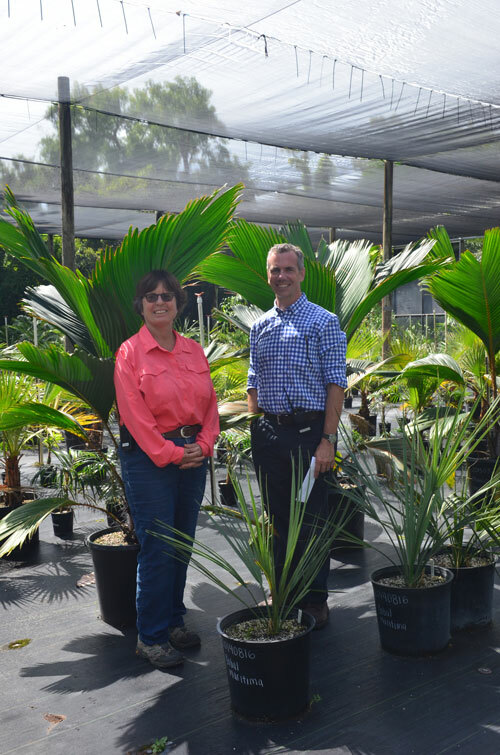 Over 600 palm specimens, among the first plantings in the Garden, were donated jointly by Mr. and Mrs. Montgomery. Montgomery said of his wife’s involvement in the Garden, It makes me tremble to think that there would be no Fairchild Garden were it not for Eleanor Montgomery. The devotion the Montgomerys lavished on the Garden is also evident in their Florida estate. Their home, designed by Robert Fitch Smith and built in 1932, is situated on a high point on the property (18 feet) with a grand vista to the Matheson Preserve and beyond that, Biscayne Bay. Originally, there was a limestone ledge that obstructed this view. According to Dr. M. Patrick Griffith, Executive Director of the Montgomery Botanical Center, when Nell first saw the home, she commented that the house was lovely, but she couldn’t see the water. Apparently, that was impetus for the Colonel to have part of the ledge dynamited to provide an unobstructed view. Nell’s house. Entrance feature, interior stairs to second floor of residence, and the grand vista to the bay from the living room. Robert Fitch Smith (1894-1964), designed the 6,300 square foot home that is perhaps best described as relaxing and inviting. There is nothing excessive or the least bit boastful of Montgomery’s financial success imposed on the architecture. 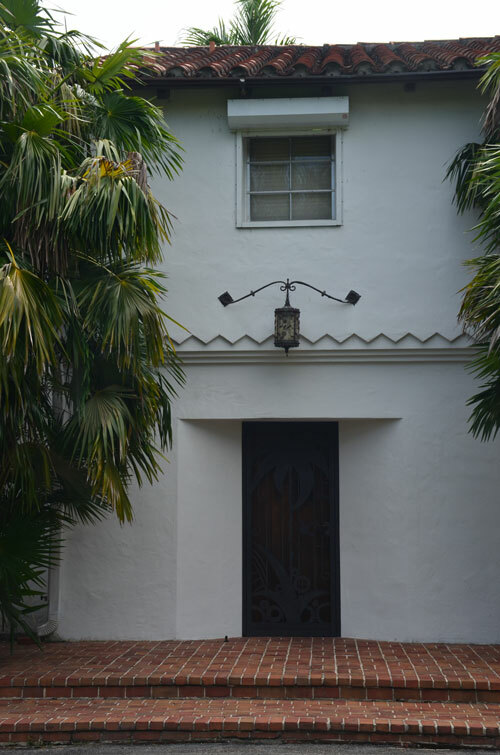 Smith combines a modified Mediterranean Revival style typical of 1920s south Florida, but includes more contemporary features, emphasizing asymmetry and clean lines. Plaster and tile work on the interior are flawless. 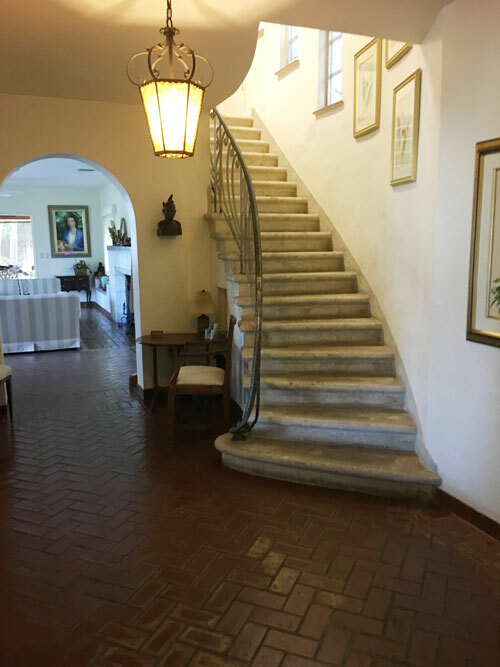 Features such as the living room fireplace and the graceful, yet sparse staircase, work in concert to create a memorable and welcoming experience. Robert Fitch Smith was an instructor of architectural design at the University of Miami from 1928 to 1931. He later became the first University of Miami Dean of Architecture. In 30 years, Smith designed over 600 residences (including the “Doc” Thomas House) and 200 civic, commercial and industrial buildings in south Florida and the Caribbean. Smith was a nationally-recognized architect who served on important local and national architectural boards. On a page of sketches of the Montgomery home he wrote, The happiest task I have ever had. The Mangrove Palm. 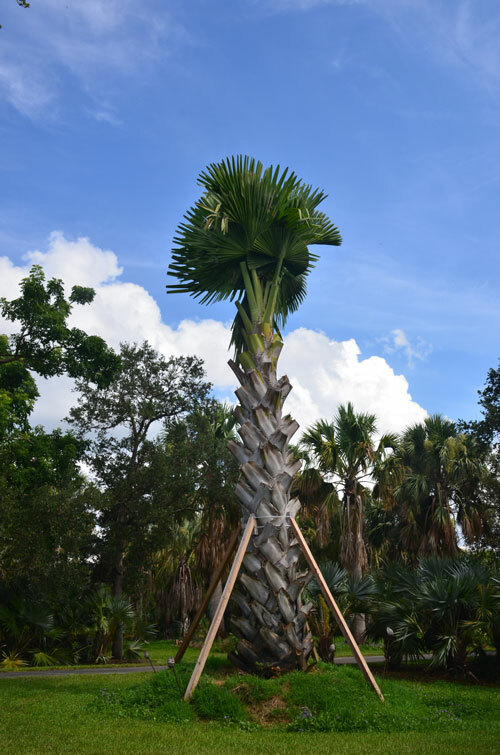 MBC is one of very few gardens in the US that can grow this palm, as it requires salt water and a frost-free climate. It has a unique growth form, where the trunks grow parallel to the ground and under the soil level, and the leaves pointing skyward. We have an intern this summer looking carefully at the pollination biology of this unique species. 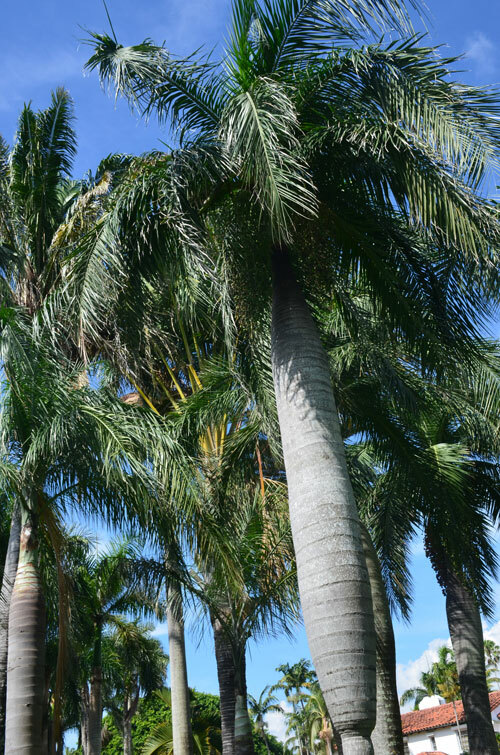 Nell inherited the Coconut Grove Palmetum after her husband’s death in 1953. In honor of Robert Montgomery, she created the Montgomery Foundation, Inc. in 1959 to keep his name associated with the plant collections and the estate and to provide a site for research investigations of the estate. The Foundation, a private, non-profit is devoted to improving the science of tropical botany by building research-oriented plant collections. In 1998, the name was changed to the Montgomery Botanical Center (MBC). In 1956, Nell married Alvin Jennings who was a managing partner in Lybrand, Ross Brothers, & Montgomery. Dr. Griffith stated that the MBC is continuing to build on the original palm and cycad collections in order to bring the diversity of plant life from around the world to the estate. MBC brings rare and endangered plants to the site for propagation and study purposes. According to a 2010 article from the MBC News, the Center conducted an evaluation and discovered that it was growing 67 plant species that could not be found in any other garden in the world. Through the efforts of Botanic Gardens Conservation International, who conducted a census of living plant collections, the scientists at MBC could compare its collection to others. Twenty-three percent of the 229 species grown at MBC at that time were threatened, vulnerable, or endangered in the world. Also in 2010, MBC had 14 trees declared Champion Trees by the Florida Division of Forestry. A Champion Tree is considered to be the largest and finest tree of its type in the state and sometimes, the country. 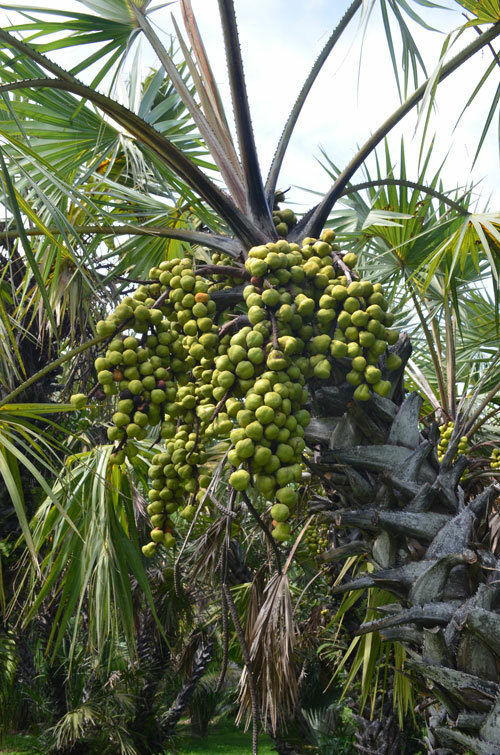 Among those recognized were a Coccothrinax bardadensis (palm), Microcycas calocoma (cycad), and Pseudobombax ellipticum (deciduous tree). Unfortunately, a number of these trees were victims of Hurricane Irma in 2017. 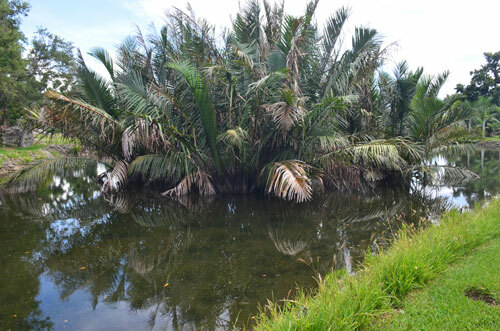 In fact, the estate required a massive clean-up that was aided by emergency funding from the National Science Foundation and other private donations to recover the palms. Vickie Murphy, Nursery Curator, with Director Patrick Griffith. Zarnia hamanni (Hamann’s Cycad) Collection from Panana. 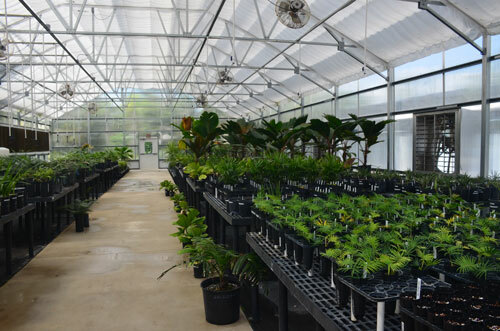 MBC propagates plants from seeds collected from wild populations of palms and cycads around the world. The seeds are germinated at MBC and the seedlings are nurtured in one of two greenhouses on the estate (one built in Montgomery’s time). 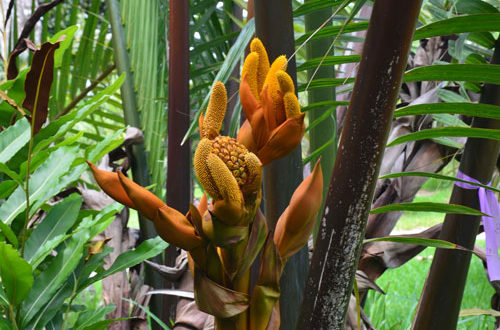 MBC is involved in The Caribbean Cycad Project, a multi-national study of the Zamia pumila. 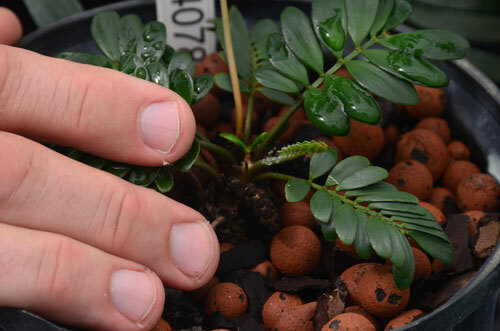 In the greenhouse grows the world’s smallest cycad, Zamia pygmaea that grows in the nutrient-poor quartz sand savannas of the Isle of Youth, Cuba (the island was known as the Isle of Pines until 1978). MBC is deeply involved in scientific research and makes its collections and data available to research scientists. The Center also cooperates with botanical institutions around the world, allowing educators and students access to its data, knowledge, and expertise. 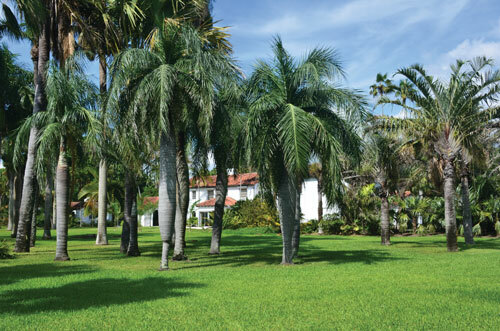 Thanks to the generosity of the Montgomery family and the many other supporters of MBC through the decades, the world continues to be enriched by the ongoing research of palms and cycads at the estate of the Colonel and Nell. 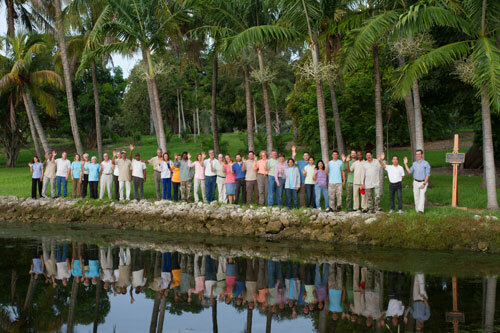 The MBC is located at 11901 Old Cutler Road in Coral Gables, 33156. To learn more about the estate, the research, or to support the foundation, see their website at www.montgomerybotanical.org. MBC is primarily a research facility. Visits by the public are welcome but require an appointment. 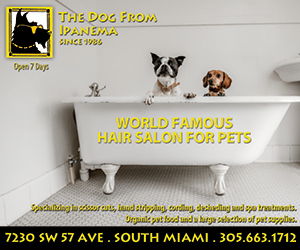 To make an appointment, call 305-667-3800. Photo taken in 2012 of staff and volunteers, after Montgomery Botanical Center was presented the “Horticultural Landmark” award by the American Society for Horticultural Science. 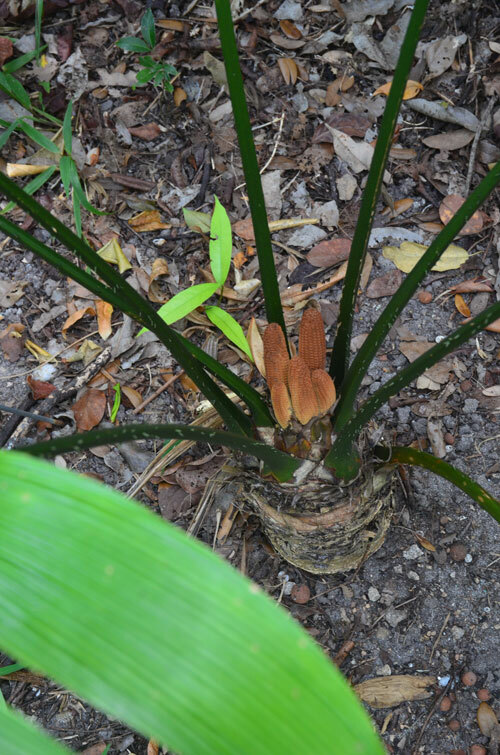 The Talipot Rendah (Corypha taliera) was damaged by Hurricane Irma. 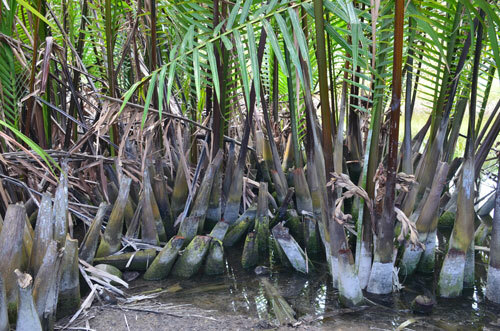 The National Science Foundation provided emergency funds to save this palm! The species is extinct in the wild, and only survives in very few gardens. It can grow for up to 80 years, but then it only flowers once before it dies. Cabana (Sabal antillensis). 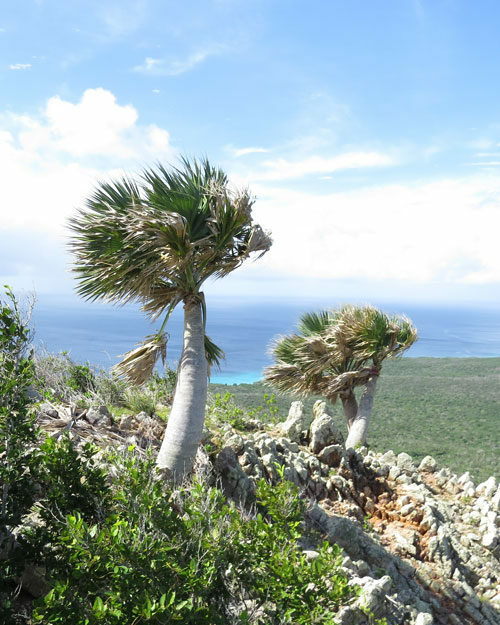 This photo was taken on the slopes of Christoffelberg, the tallest mountain in Curacao. 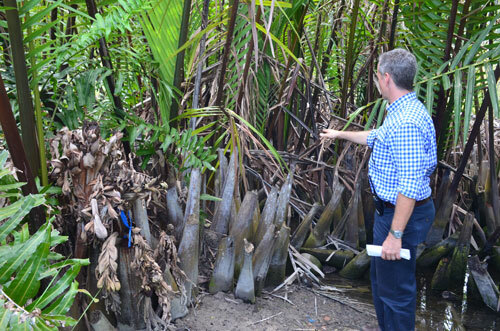 This palm species is a new discovery, known to science only since 2017. 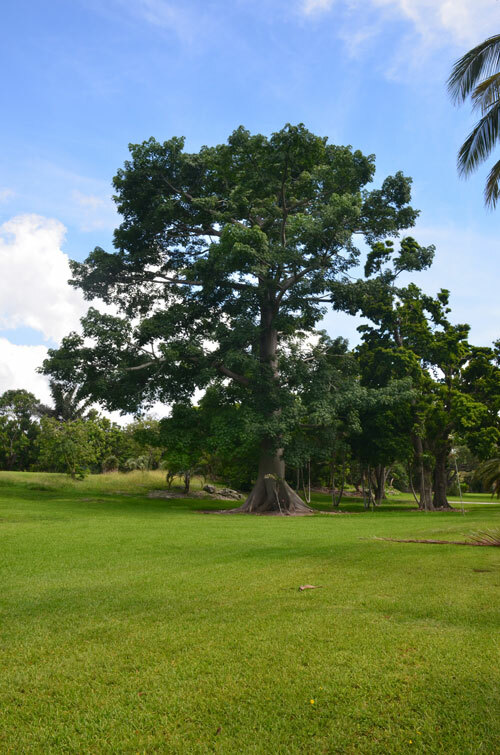 The Kapok Tree (Ceiba pentandra) is one of the largest trees at Montgomery, but is only 50 years old. It has an amazing stature, and very interesting buttressing roots. In the spring, it produces many thousands of palm flowers which cover the ground.